Sexing: When in breeding plumage the males are bright red. When not in breeding plumage the males and females look alike. Breeding: Difficult to get started but once they are experienced breeders they do very well. They will require extra protein and privacy. Social: Somewhat. 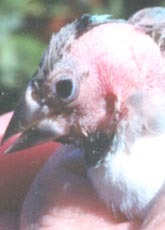 They are easily disturbed by other finches in the cage and are very aggressive towards their own species and any other red colored finch during their breeding cycles. Housing: These finches require a large covered or planted area to feel secure. Diet: A standard finch mix, cuttlebone, oyster shell, fresh water. Plus egg food and insects. Same of their favorite seedsare yellow, golden or panicum millet.